The diesel, unlike the Type R, is not a car to be pushed. The 1.6-litre engine is quieter and more refined than ever before providing the driver with confidence and a nice ride. A mainstream manufacturer with a sensible family hatchback introducing a diesel model? Are they mad? Not to preach to the choir too much, but a modern diesel engine is no dirtier than a petrol equivalent, and still uses less fuel to travel a given distance. If you’re a high-mileage driver, it’s the sensible choice, and there are a lot of high-mileage drivers out there. 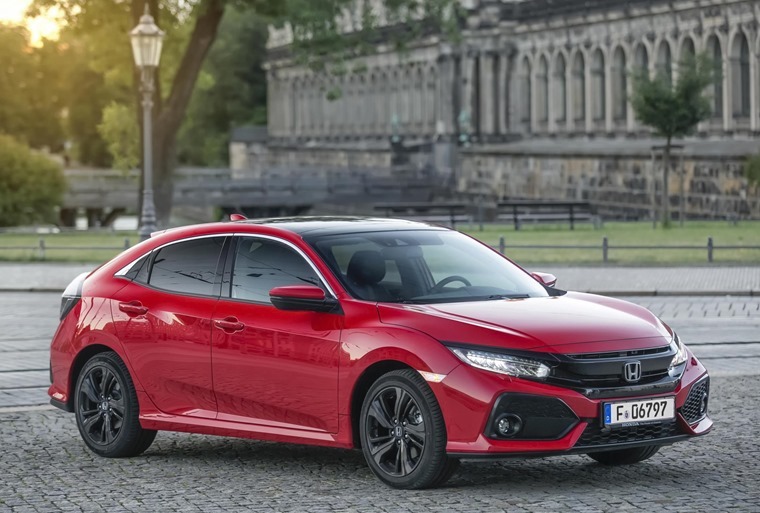 Which is why you might be considering the new Honda Civic. 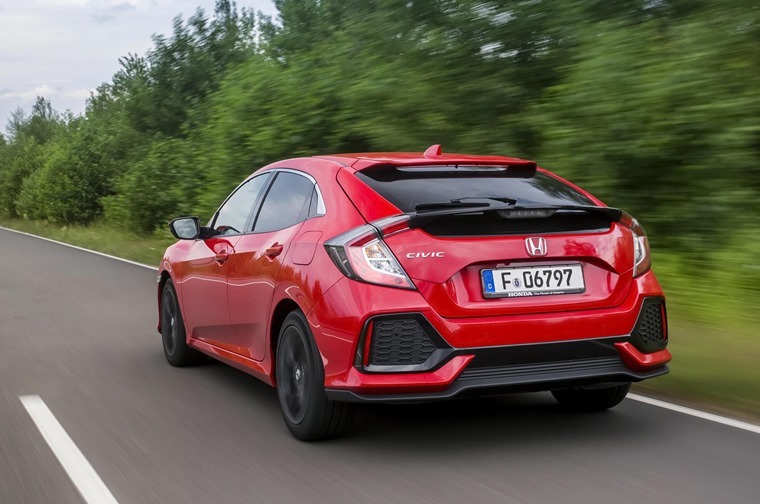 The i-DTEC engine under the bonnet of this Civic is a 1.6-litre unit that uses less fuel than its predecessor, pumps out less CO2, creates fewer NOx emissions and particulates, and is quieter and more refined than ever before. Even more impressive, there’s no need for an AdBlue tank to clean up the emissions, so Honda’s unit won’t need an expensive top up every few thousand miles. The engineers at Honda HQ have extracted just 120hp from the engine, which sounds a little low, but it was fine for the old car. The headline figure also doesn’t show how much progress has been made with refinement. At startup there’s little diesel clatter, and under normal use you’d be hard pushed to tell what engine is up front. Yes, thrash it to the redline and it gets very gruff, but then you’re missing the point of the diesel power. Relax into the 300Nm of torque, rely on the low-end pull, and the performance is perfectly adequate if not earth shatteringly exciting. This is no Type R.
Analogue dials, digital displays, lights, menu options, LCD panels - it’s all there in front of you. Despite the confidence in the engine, Honda has decided to avoid placing a diesel badge on the back of the car but apart from this there are no other cosmetic changes to the car. That means the rather bold exterior remains, with the designers finding their box and angles and adding them all to the car. The same holds true inside, where you drop into a low seat that presents a futuristic dashboard to you. Analogue dials, digital displays, lights, menu options, LCD panels - it’s all there in front of you. While that may sound overwhelming, it all works surprisingly well. Sadly the same can't be said of the infotainment system. If you don’t have a phone you can connect via Android Auto or Apple CarPlay (and if you can find where to plug your phone in without resorting to the manual, you’re a better person than me) then you’ll be better off tearing the screen from the car and carrying a portable radio with you. The supportive seats make the front feel a little tighter than it is, but there’s plenty of headroom and storage space. The rear seats aren't quite so spacious, but there’s enough for two adults to get comfy, and the boot is larger than you’d find in a Volkswagen Golf. Adding a diesel engine hasn’t reimagined the Civic, it remains almost exactly as it did before. Driving dynamics remain unchanged too, with a reassuring solid feel to things. 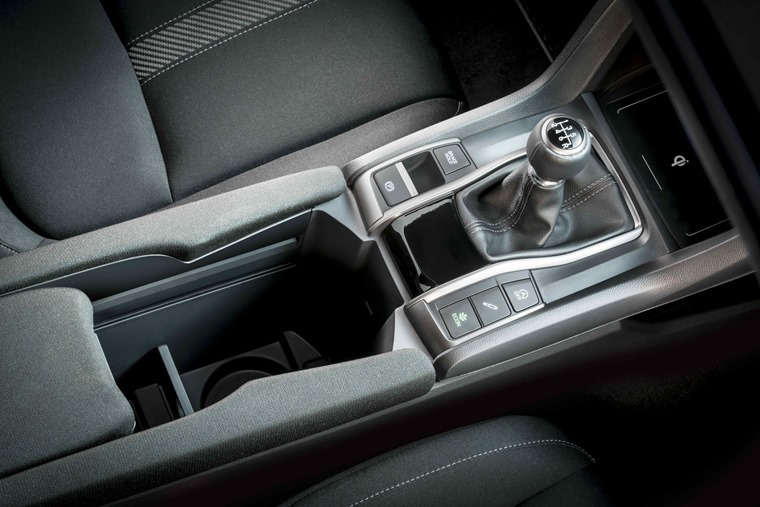 The Civic controls its body well, remaining mostly flat in corners and giving the driver confidence with direct and precise steering. It rides quite nicely too, although the adaptive dampers fitted as standard to this top-spec EX model might be helping there. 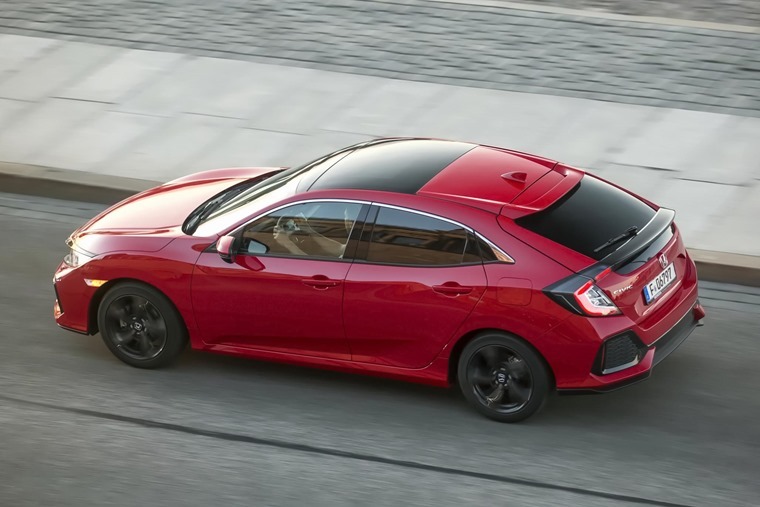 Adding a diesel engine hasn’t reimagined the Civic. It remains almost exactly as it did before, but uses less fuel and goes further between fuel stops. It remains practical, comfortable, reasonably sporty, and distinctive, while adding frugality. 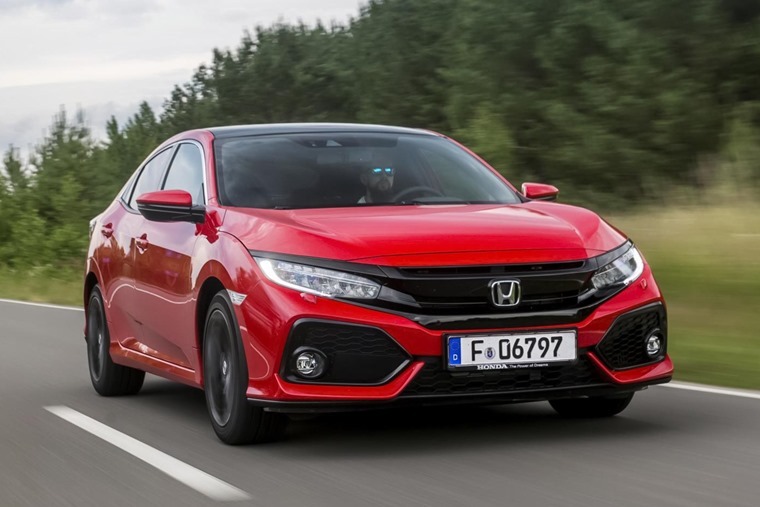 It’s more expensive to buy, and there's doubt over residual prices (thanks to the governments dithering on diesel’s future) that has hit leasing costs a little, but a low BIK rate, strong economy and a Honda’s famed reliability will minimise the difference. If you’re covering just a few thousand miles a year, the petrol engines remain the right choice. For those covering anything beyond ordinary, the diesel option is a no brainer. Retains the sporty look and bold exterior of previous generations. Low seats and futuristic dashboard add to the sporty look of the car. Infotainment leaves a lot to be desired. The diesel, unlike the Type R, is not a car to be pushed. Rides quite nicely and gives the driver confidence with direct and precise steering. The 1.6-litre i-DTEC diesel engine is quieter and more refined than ever before. At 80.7 mpg it uses less fuel than its predecessor, pumps out less CO2, and creates fewer NOx emissions.